I just realized yesterday that I haven't written one update on Baby M since announcing the pregnancy. So without further ado, here ya go! Here are the last few weekly pictures that I have taken. I went to the doctor for the first time here in CO during week 15. Everything looks great and Baby M's heart rate was a fast 160. I am borrowing this little idea from the Little Baby Gavin blog. Total weight gain: I have no idea! lol I lost so much weight the first trimester (about 10 lbs or so) that I really don't know. I think I have gained about 2 or 3 lbs. back since I have been feeling better. Best moment this week: Getting my prescription of Zofran refilled! lol I ran out of it for a couple days and was immediately sick again. SO NOT FUN! Guess I will be sticking with this for a few more months. Miss Anything? Sleeping on my back! Week 16 was the first week that you are officially not allowed to sleep on your back but I have been trying to do it for a few weeks now. I must admit, I do end up that way a few times during the night but not for very long. But I miss it oh so much! Movement: Not feeling anything yet or at least to my knowledge. I could be and just haven't realized it yet. Food cravings: I actually haven't had any cravings yet. Ok, I take that back. I had 1 a few weeks ago for chips and salsa but that came and went and I don't have anything else. In fact, I am actually so tired of food! I am probably the only pregnant person to ever say that but I am tired of always having to eat something. Anything making you queasy or sick: Not so much anymore, unless I don't have my meds or I wait to long to eat something. Also, I discovered that I just can't eat a steak anymore. Symptoms: INSANE back pain! Have had it for weeks and depending on how much I try to do, it gets worse. I frequently walk like a little old lady who lost her cane. My hips also hurt if I sleep on one side too long. Looking forward to: Obviously, Jan. 13 to find out the gender but also Christmas this weekend. Family has already sent Baby M some presents so it will be fun opening them up to see what they have received. I will do my best to update every week. I normally take my weekly picture at the end of each week so that my belly grows that whole week so look for updates at the end of the week. Also, I want to know what you think Baby M will be!! I added a poll in the top, left hand column so please cast your votes for whether you think Baby M will be a Boy or a Girl! Back pain, 160 heart rate... could be a GIRL!!! (though, my little man had a fast heart rate). Oh my gosh! I didn't even know! I'm so behind on blog reading. Like, 3 mos behind. I'ms o happy for you! I know you wanted this and the power of prayer is amazing! Congratulations! BTW, my had a HR or 160. Thought for sure it was a girl. I have two boys! you've read the baby garvin blog. i love her weekly updates they are so creative. i want to document like that one day. you look great and i bet its a girl. How exciting! I remember fondly how exciting all of the little things that come along with pregnancy are. I also remember all too well that annoying back and hip pain! But, I will say... If you are comfy on your back, you can sleep on your back. You won't stay that way all night long and if it helps you fall asleep easier then it isn't that big of a deal. Also, tucking a pillow in between your legs can help alleviate some of that pain from being on one side. At least for me it did! SO excited for you guys :) Love reading these little updates. It'll be sucha fun thing for you to look back on later. Looking good! These weekly update questions are so fun to look back on... I read my old ones all the time! I'm going to guess boy based solely on your cravings..from day one I wanted to eat SWEETS for every single meal...and would randomly crave anything/everything i saw on tv or a billboard. Excited to see what you're having - thanks for stopping by my blog as well!! :) take care! Such a great update and journal for you to look back on! Zofran was a miracle drug for me so I'm with ya sista! Glad you found it. I took it until late in my second trimester. 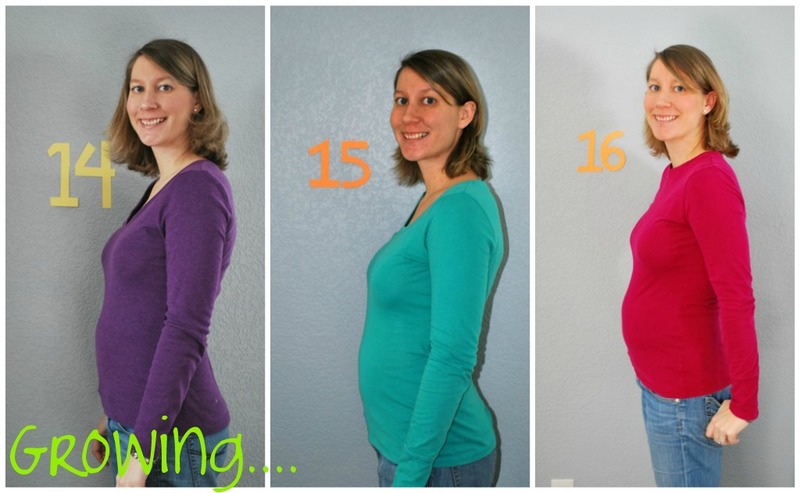 I always enjoyed the third trimester since I was finally feeling better! I'm sure you will too.